Anatomy: Measuring up to four feet long, ocelots are about twice the size and weight of ordinary house cats. Female ocelots are slightly smaller than the male usually growing to 2 1/2 feet in length. The female ocelot carries a litter of two kittens and parents them for a year. Males do not share in the parental responsibilities. The ocelot's buff to sandy brown-colored coat is covered in a mixture of black spots and small rosettes with distinct markings around the mouth and eyes. Its underbelly is light with black spots and its 14-inch long tail is covered in dark spots. Habitat: The ocelot's main requirement for survival is dense foliar cover, which may vary from arid scrub to tropical forest. This flexibility allows ocelots to populate an area from southern Texas through Central and South America. Ocelots are terrestrial and mostly nocturnal. They tend to sleep hidden in thick vegetation on the ground, but may climb trees during the day to rest. Males and females will sometimes share a territory, which may be up to three square miles in area. Diet: Being nocturnal, ocelots hunt at night. Because they swim well, they will often hunt for fish. As occasional climbers, they will catch birds. Small rodents, rabbits, opossum and iguanas are also a main source of prey. The female ocelot's range is about 1 1/2 miles, while the male's can be up to 11 miles. 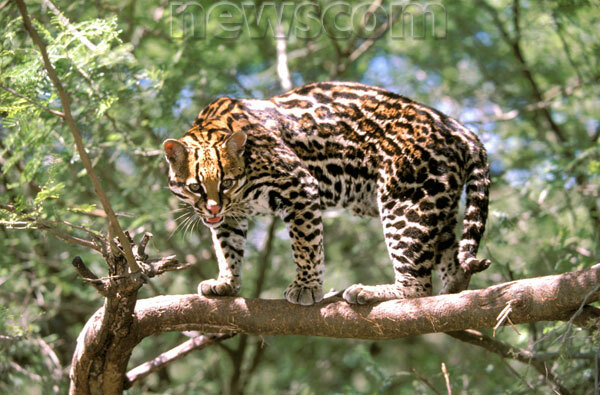 Threats: Ocelots have been hunted since the ancient Aztec civilization. The highly prized, distinctive coat is an incentive to poachers. Their numbers continue to diminish today because, along with demand for fur, they are trapped for the exotic pet trade. Deforestation combined with direct human threats put the ocelot on the Endangered Species List in 1972. How You Can Help: By providing communities and businesses with economically viable alternatives to forest destruction, the Rainforest Alliance is helping them to ensure the health and survival of wildlife habitats and the plants and animals that depend on them. With your help, we can reach a tipping point in favor of forests and the people and wildlife that depend on them. Like other cats, ocelots are adapted for eating meat. They have pointed fangs used to deliver a killing bite, and sharp back teeth that can tear food like scissors. Ocelots do not have teeth appropriate for chewing, so they tear their food to pieces and swallow it whole. Their raspy tongues can clean a bone of every last tasty morsel. Many ocelots live under the leafy canopies of South American rain forests, but they also inhabit brushlands and can be found as far north as Texas. These cats can adapt to human habitats and are sometimes found in the vicinity of villages or other settlements. Ocelots' fine fur has made them the target of countless hunters, and in many areas they are quite rare, including Texas, where they are endangered. Ocelots are protected in the United States and most other countries where they live. Female ocelots have litters of two or three darkly colored kittens. In northern locations females den in the autumn, while in tropical climes the breeding season may not be fixed. This cat is probably the best known of the South American cats because of its pelt being the mainstay of the fur trade, and for the fact that it was frequently kept as a pet. Due the fact that Ocelots are high strung, unpredictable, comedic little cats, humans de-fanged, de-clawed, de-scented, and altered these cats in order to make them conform to the “pet” industry. Like all exotic cats, these creatures, male or female, altered or not, spray a foul smelling urine on everything they wish to mark as theirs including their keepers. In the 1980’s, Ocelot fur coats sold for $40,000.00 and the live animal as a pet sold for $800.00. At one time, more than 200,000 ocelots per year were killed for their coats. Today, with laws prohibiting hunting for the fur trade, there are no Ocelot coats for sale, and the “pet” Ocelot is a thing of the past. At Easy Street, we have turned down offers of $15,000.00 for just one of ours! Size and Appearance: The Ocelot is much larger than its cousins the Margay and the Oncilla, although they bear a striking resemblance. The Ocelot weighs between 17-24 pounds, stands 16-20 inches tall, and reaches lengths of 48-64 inches. Its coat tends to be more blotched than spotted, and the chain-like blotches and spots are bordered with black, but have a lighter colored center. These markings run the entire length of the cat. The ground color varies from whitish or tawny yellow through reddish gray to gray. The underside is white, and the backs of the ears are black with a central yellow spot. In captivity, Ocelots have lived more than 20 years, as compared to 7-10 years in the wild. Habitat: The Ocelot is found in very diverse habitats including rain forest, montane forest, thick bush, semi-deserts, coastal marsh, and along river banks, but it is never found in open country. Reproduction and Offspring: After a gestation of 79-85 days they produce a litter of 1-2 young. They weigh approximately 8.5 ounces at birth. The females reach maturity at around 1½ years, and around 2 ½ years for males. They become independent at around 1 year of age, but seem to be tolerated in their natal range for up to another year. Social System and Communication: Ocelots are solitary and territorial. The females defend their exclusive territory, which can be as much as 9 sq. miles, while the male’s territory is larger and overlaps that of 1 or more females (can be as large as 35 sq. miles). Ocelots communicate by use of scent markings which tells the males when she is ready for mating, and by vocal communications such as meows and yowls (in heat). Hunting and Diet: The Ocelot is a terrestrial hunter and active during the night (nocturnal), and the mainstay of its diet are nocturnal rodents, such as cane mice, and marsh, spiny and rice rats, opossums and armadillos. They will also take larger prey such as lesser anteaters, deer, squirrel monkeys and land tortoises. They will also take advantage of seasonal changes and the abundance of fish and land crabs during the wet season. Occasionally, the will take birds and reptiles. However, the majority of prey items for this cat weigh less than 1-3% of its body weight. Principal Threats: Ocelots have a small litter size, one of the longest gestations and growth rates among the small felids, and a high infant mortality rate. Add this difficulty in sustaining its own population with deforestation and habitat destruction, and the survival of this beautiful little species becomes even more difficult.